The European nuclear industry is facing one of its biggest challenges since its establishment in the 1960s. A generation gap has caused many problems in terms of operation, maintenance and commissioning of the nuclear fleet in Europe. 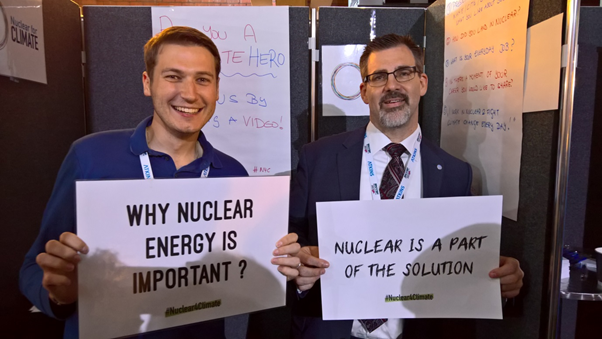 The ENS Young Generation Network and its flagship event the ENYGF are confronting this problem since many years now to bring young nuclear professionals together to exchange their knowledge and to strengthen their network. In 2017, the UK hosted the ENYGF and invited over 500 young professionals, PhD students and graduates to Manchester. Four days packed with expert speakers from the industry, interactive workshops, technical presentations and rounded off with the visit of UK’s nuclear sites. According to the motto of this year’s edition, the plenary discussions followed the structure of the heritage, nuclear innovation and an outlook into the future of our industry. Even the visit of the Wylfa Nuclear Power Station consisted with the subject, showing the heritage, two MAGNOX reactors in decommissioning, and the bright future, the construction site of Europe’s first two ABWRs. In contrast to the technical backbone of the Forum were the social activities in the evening. The museum of Science and Industry, the Old Trafford and the Northern Quarter visit gave lots of opportunity to share the experiences of the day and meet new people from all branches of the industry and research all over the world, from Spain to Australia. The ENYGF 2017 was a great chance to expand the Young Generation Network and give the people faith for it is our bright future.